[Final Update] Kurtonium Media: With our users’ support, we got what we deserved! FINAL UPDATE: They refunded the money! Thanks to all my users for supporting me 100% all the way through. However, I ask that you not do anything childish towards the BurstNET twitter account, because that is not what I stand for. Thanks, and thanks for your continued support of gkurl.us and Kurtonium Media! Update #2: I sent a message at 10:29 PM on the 28th and have not heard back from them yet, maybe they’re not there on the weekend? Update #3: I paid the $50, and have closed the incident with the third party. I will be fighting this, but they still have not responded, and the VPS is still offline. Update #4: We have decided that for our users sake, it would be best if we paid the fee, and have service restored. We still hope to fight this, and we have filed a complaint with the Better Business Bureau. We’re currently backing up ALL of our data if we need to move, and gkurl.us will stay on the backup server for the time being. We’re still asking for your support by spreading this info on twitter, and any other social sites in order to get our message out, and put the pressure on BurstNET to properly address this issue. Update #5 Full service has been restored, and we are working on an email to send to the CEO. Congrats, BurstNET, this could be considered libel. RT @burstnet: …to the rest of you: grow up. the guy screwed up, missed responding to email, or got it caught in his spam filter. caused his own issues. They don’t know that it got caught, they are portraying me in a negative image, without actually knowing what happened. They are posting MY confidential information about the workings of my website, and interactions with BurstNET, which is a DIRECT VIOLATION of their SLA. of any Confidential Information would irreparably damage the owner or supplier of such Confidential Information. Thanks a lot, BurstNET, for violation of SLA, and breaking the privacy agreement. I will be digging deeper into this, and if action is necessary, than maybe that is the way I will go. Dear loyal users,Our data and websites are being held hostage! On Thursday, I received a message on IM saying that gkurl.us (part of Kurtonium Media) was down. I immediately checked the site, and it did not respond. I then tried to load the control panel for the server, but again nothing. BurstNET, telling me that I had been charged a $50.00 TOS/AUP violation fee on my account. except a single notification regarding BurstNET affiliate referrals. please help to close these offending portals sites(1) so far. please do this carefully, pay attention for redirects also! Also, please consider this particular machines may have a root kit installed ! disabling cgi may not really solve the issue ! the appropriate law enforcement agencies notified. PROBLEM, THEY WILL BE BACK! other responsible admins, or similar agencies. because your spamfilter will not pass this ! this attribute for your email contact! concerning this offending network block(s). Please disable the site, investigate the issue and immediately inform us of actions taken to prevent further abuse. Note: Removal of the material is NOT a sufficient solution. You must also find the source of the files and take necessary measures to prevent this from happening again. We would appreciate your prompt attention to this matter. within 24 hours, a $50.00 fee will be assessed. Join the community on the redesigned BurstNET Forums! News, Service Advisories, Discussions, Product Support and More! So apparently sometime on the 26th, the third party sent a complaint concerning the gkurl.us website that a user-submitted link (which was deleted the same day, as links are moderated daily) had shown up. There are several services out on the web that check websites for phishing, and send reports to hosts about it. Our host did NOT inform us about the phishing link . We want to restore full service to gkurl.us, but will not back down and be accused of phishing, or let a provider bully us into paying them a ridiculous “fee”. 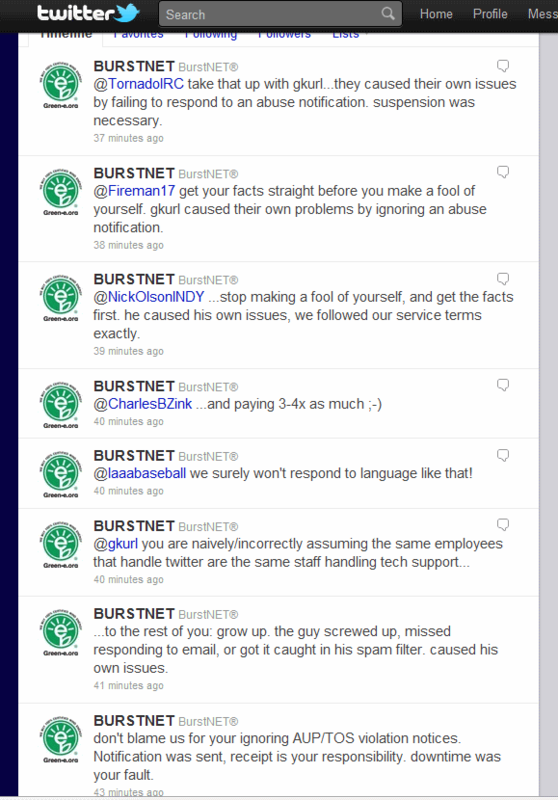 We’ve read BurstNET’s TOS, but do not see anything we violated in it, since we never RECEIVED any email. We intend to move server providers if our provider contends that it is our fault that a phishing URL existed on our site for a few hours. We apologize to our users, especially our API and App users for the problems. Please spread this on Twitter and anywhere it can be read, to help us restore service and get back out data. © 2019 Laaatech. All rights reserved.